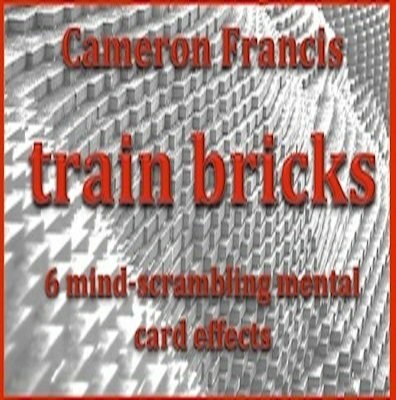 Get ready for six new new mental magic effects from the fertile and slightly deranged mind of Cameron Francis. All of these effects are well within the range of most magicians. No knuckle-busting sleights. No gaffs or gimmicks. All of the tricks use a normal deck. B'WAVY GRAVY - The spectator takes five cards from a shuffled deck, shuffles them, and then discards all but one. The magician instantly knows which card was selected. OUT OF THIS PACKET - A small packet Out Of This World effect with an awesome kicker! CARDNECTION - A spectator freely selects a card (really!). The deck is given a few cuts. Another spectator freely touches a card - it is the first spectator's card! PRECIENT - An ACAAN where the magician successfully predicts both the card and number. HIDE, KEEP and GIVE AWAY - An almost self-working version of Jay Sankey's awesome triple prediction effect. This is a wonderful collection of mental card magic, most of which is impromptu. "Cardnection" is a perfect trick to perform for couples, and is very easy to do. It has gone straight into my working repertoire. "Creation" (as Stephen Tucker said) alone is worth the price of the download. It is mind-blowing, self-working, and is in my opinion, the finest use of its principle ever created. Get this download now. Do not hesitate. It is worth every penny, especially for "Creation".